The first thing that many individuals do when they purchase a home is begin to customize the home to fit their own tastes. Although many people tend to focus on the larger areas of the home, such as the living room and the kitchen, the smaller areas should not be neglected. Once of the best ways to dress up and customize your home is to create a unique bathroom design that showcases your taste and style. Just as many visitors to your home will see your bathroom as will see your living room, especially if there is only one bathroom within the home. By creating a unique bathroom design for your home, you will be making this smaller area seem more inviting and comfortable to both your family and your guests. 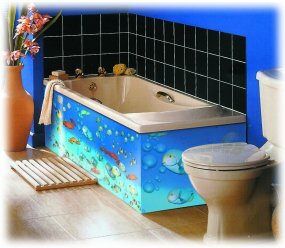 The design of the bathroom is only limited by your imagination and the size of the area that you have to work with. When creating a unique design for a smaller bathroom, there are a couple of tips to keep in mind. The first is to try to avoid using dark colors on the walls of a small area because the color of the walls will make the bathroom seem smaller than it really is. 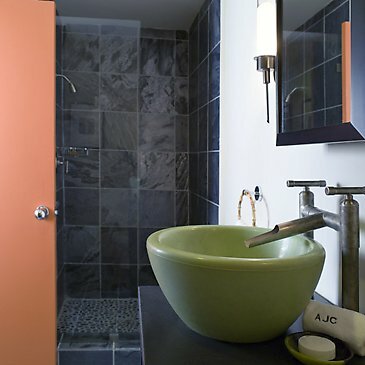 In small bathrooms, the homeowner should try using bright, light colors which will give the illusion of space to the room and make it appear much larger and more open. Another thing to remember when decorating a small bathroom is that simplicity is best. Lots of decorative items and knick-knacks present in the bathroom will give the bathroom a claustrophobic feel, while minimal additions to the room will have the exact opposite effect. Many homeowners with small bathrooms even choose to use recessed lighting in their bathroom so that the lighting fixtures do not extend into the bathroom, making it appear smaller. There are many more options for individuals that have larger bathrooms in their homes because they have the space to do things that homeowners with smaller bathrooms cannot. Some of the unique designs available for larger bathrooms have separate bath tub and shower areas, add bidets or dual sinks into the design, or create open space between each of the different fixtures in the bathroom. A unique design for a large bathroom can include many more design elements than the design for a smaller area and the homeowner can include more elements that reflect their taste and style.